Now, if you’re not familiar with the 40k universe, Space Marines are supposed to be near godlike in their prowess – they’ve been genetically engineered to be able to survive starvation, the shutdown of several of their major organs, weeks without sleep, and to a limited extent, hard vacuum. They’re nails, they are. The Tyrannids, on the other hand, are as close to Alien/s as you can get without getting sued, I’d imagine. They are legion, they are icky in a way that biological mutation has got a monopoly on, and to top it off, they’ve borrowed the ‘unstoppable’ schtick of zombies or the Terminator. They absolutely will not stop until you are dead. I ran the game twice, solo – I’d played only once before. So when I tell you that my initial solo crushing defeat at the hands/claws/mandibles/appendages of the Tyrannids in the uncomfortably warm, humid, stinking bowels of this nameless interplanetary vessel was an improvement over my first train-wreck of a failure, you’ll perhaps understand that I was buoyed by the improvement! My third game, is the one that I shall hold dear to my heart, however. Three squads of Marines rejoiced in the chance to serve their Emperor and gruffly stepped foot on enemy territory. Six brave, neo-human super-soldiers, equipped with the best armor and weapons and skills that thousands of years of human military-industrial worship had developed. In the first segment of the ship, several small clusters of Tyrannids tested our defenses, and through incredibly considered actions and luck, were contained and destroyed. Some were even locked behind a fortuitously positioned door! (Oh the doors – if you should ever play this, DO NOT UNDERESTIMATE THE DOORS.) In the second section of the ship, careful support and near-ballet like maneuverings carried our luck a little further. In the third and penultimate section of the ship, there were no doors. (This sent me into somewhat of a panic, as I had leaned on their utility to rid me of swarms as we moved through the ship.) In the third section, there was a furnace control panel that could be activated that would roast the blighters alive – or vaporize the Marine operating the controls. With the swarms sweeping around the perimeters (you could hear the motion sensors beeping with increased insistence) and gaining in sizes and boldness, I ordered my Marines to use the control panel not once, but twice – sending the acrid reek of roasted alien roaring through the ship air vents and leaving piles of ash where more than half of the threatening Tyrannids had stood. I was buyoant! I was confident! I was so happy, I wanted to show off the state of the card layout to anyone who would look. Which meant, of course, that within seconds afterwards, the aliens crawled from their hiding spaces afresh. Two unlucky encounters of the sixth kind later and a pair of the squads were suddenly at half power. Why had I allowed that moment of pride to tip off the petulant gods of dice rolling? No matter, with four of the original six Marines, and with no doors to seal the aliens behind, we traveled to the fourth and final area of the ship – the heart. Our task was to operate the controls for the on-board missiles – detonating them in their bays if necessary – thus taking out the ship and the alien infestation that it carried. On a ship this old and this broken, it would take time. A kind look from the whims of fate meant that one of our Marines could be patched up enough to hold a weapon, and he returned to the fray. Meanwhile, the aliens made their last and keenest attempt to wipe us out. Several Marines worked on the controls, wasting precious time flipping switches while their brothers were facing off dripping maws and venomous claws. Another Marine fell, we were back down to four men standing. One of the Marines attempted to fire the missiles, but they weren’t yet ready. Precious time lost again. In the horror of battle, everyone ended up facing the wrong way and we sensed that if the end were to come, it were to come very soon. A last attempt to get the firing mechanisms blasting was successful, and now six Marines can pass on, knowing that they have done good work in the Emperors name. I won the game, fighting tooth and claw, on a very, very, difficult little card game that doesn’t let you get away with any mistakes. If board and card games are your thing, then this is the Space Marine card game equivalent of Pandemic – you need to keep on top of increasingly dangerous piles of threat, and co-ordinate all of the Marines, taking the very best advantage of their special skill abilities. Great fun – but I imagine a rather unforgiving first game! Expect to have to play it twice before you get the hang of it, at least. 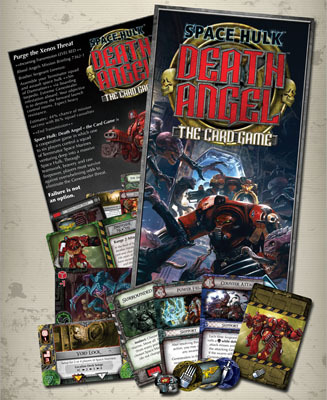 Space Hulk: Death Angel official site, and the Board Game Geek page for it.